Donald Trump will inherit a job market that is strong but perhaps not quite firing on all cylinders. U.S. employers added 178,000 jobs in November, the Bureau of Labor Statistics reported Friday, and the unemployment rate fell to 4.6 percent, its lowest level in more than nine years. But other figures in the monthly report were less encouraging: Hourly earnings fell and more Americans stopped looking for work. 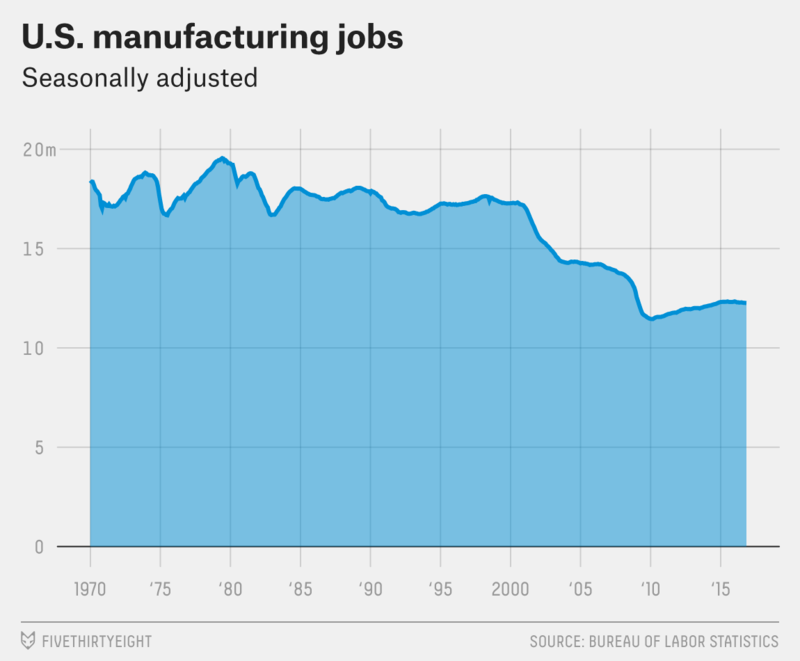 The manufacturing sector – a focal point both during the campaign and in recent days — continued to shed jobs. 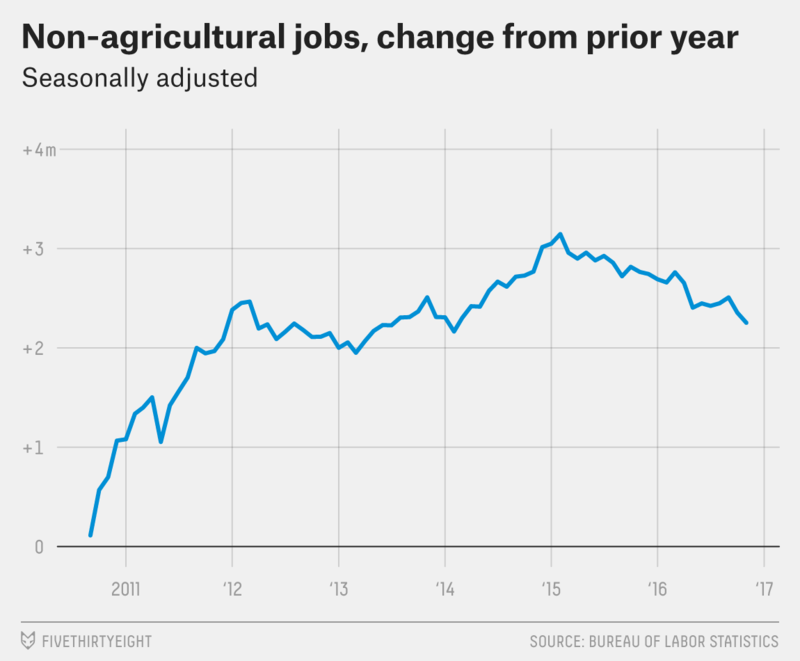 This was, truth be told, a weird jobs report. It’s hard to imagine a scenario in which unemployment is low and job growth is steady, yet wages are falling and people are leaving the labor force. That suggests Friday’s report, taken on its own, paints a misleading picture of the state of the economy; as always, it is best not to read too much into the month-to-month swings of the various indicators. The bigger picture is that hiring has slowed from the breakneck pace of a couple years ago but remains solid. Wages, a one-month blip notwithstanding, are rising but not necessarily accelerating. The labor market is improving, but falling unemployment hasn’t brought the kind of gains – in terms of pushing up pay or drawing in new workers – that economists (and workers) would like to see. Nearly a month after Election Day, it remains unclear what Trump’s economic priorities will be once he takes office. He drew headlines Thursday for brokering a deal with Carrier to keep some jobs in the U.S. that the Indiana manufacturer had planned to outsource to Mexico. But that deal affected roughly 1,000 jobs, not even rounding error in an economy that creates and destroys millions of jobs every month. He and his advisers have discussed investments in infrastructure, which could provide a short-term economic boost, and he has promised to lower taxes and reduce regulation, which could have effects over the longer term. But he has provided few details about his plans, and his Cabinet appointments so far haven’t provided much insight into his thinking. What is clear is that Trump will take office with an economy that looks far stronger than the one that Barack Obama inherited in 2009. Today’s concerns about the pace of wage growth or the shrinking of the labor force pale in comparison to the hundreds of thousands of jobs that were being lost each month eight years ago. In theory, the lack of an immediate crisis should give Trump the opportunity to think about the longer term. We will soon learn what he does with that chance. 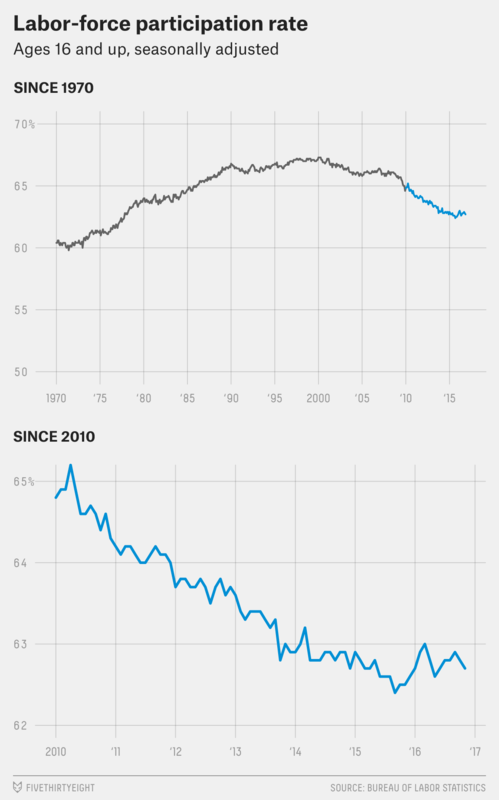 A “bad” decline in the unemployment rate: Trump has often suggested that the unemployment rate is rigged by the White House for political reasons. That is false. But it is true that the unemployment rate can be a misleading economic indicator, and Friday’s report is a perfect example of that. The unemployment rate fell three-tenths of a point, which sounds like good news. But the government only counts people as unemployed if they are actively looking for work. 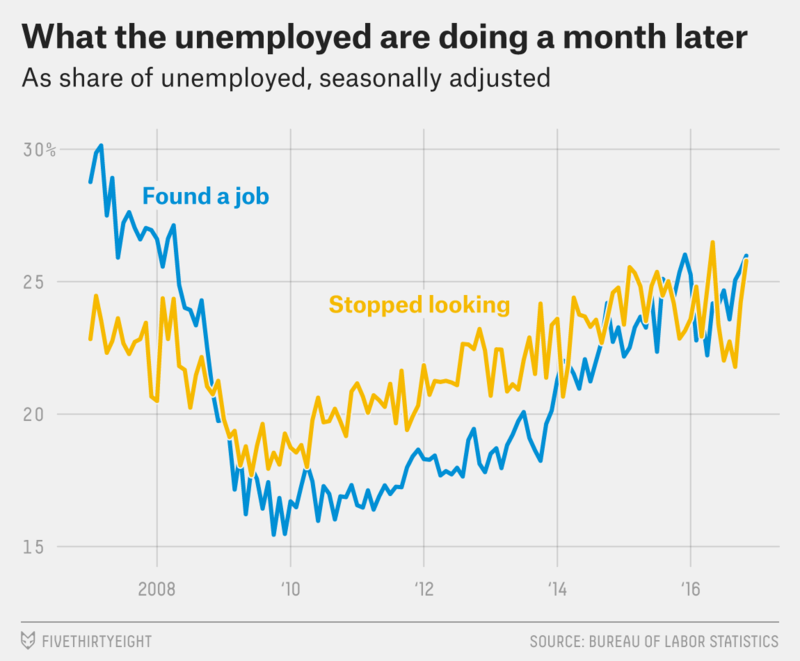 Most of November’s drop was driven by people who stopped looking for work, not by people who found jobs. Economists often look at the share of the population that is working or looking for work, a measure known as the labor-force participation rate. The rate plummeted during the 2008-09 recession and the early stages of the recovery, driven by a combination of the weak economy and the retirement of the baby-boom generation. More recently, the rate has been volatile, rising sharply in late 2015 and early 2016, then bouncing around for the rest of this year. The safest interpretation is probably that the participation rate is no longer falling but that it isn’t rising much either. That’s probably about the best we can expect given the demographic forces working against it. Wages fall: The story of last month’s jobs report was the big increase in hourly pay, which suggested workers were finally seeing the benefits of the 7-year-old economic recovery. Friday’s report throws some cold water on that idea: Average hourly earnings fell for the first time in nearly a year and a half. The earnings figures move around a lot from one month to the next, so it’s better to focus on the year-over-year rate of change. 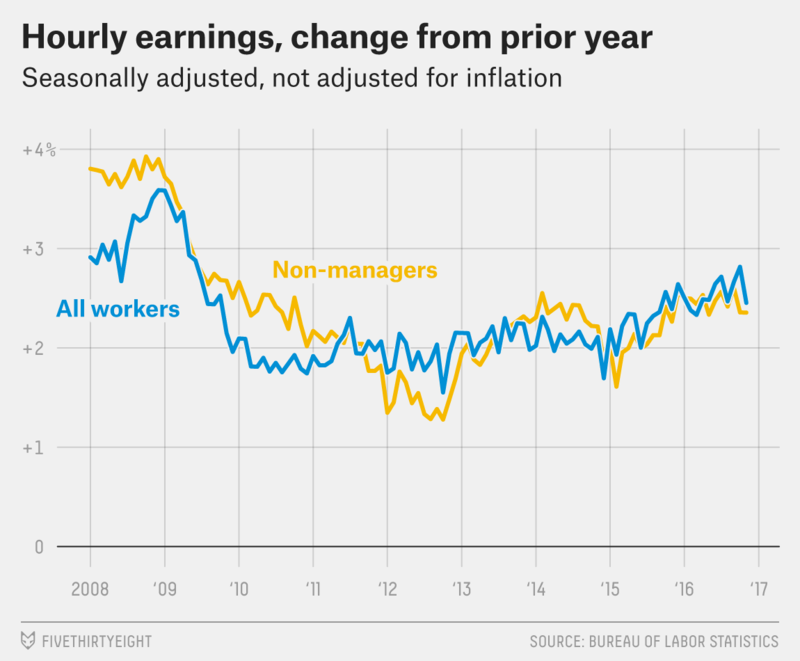 That measure looks less worrisome: Earnings are up 2.5 percent from a year ago (2.4 percent for non-managers). That’s faster than inflation, which is under 2 percent annually, and also faster than the 2 percent pace seen earlier in the recovery. But wage growth doesn’t seem to be accelerating the way many economists would expect during a period of low unemployment. 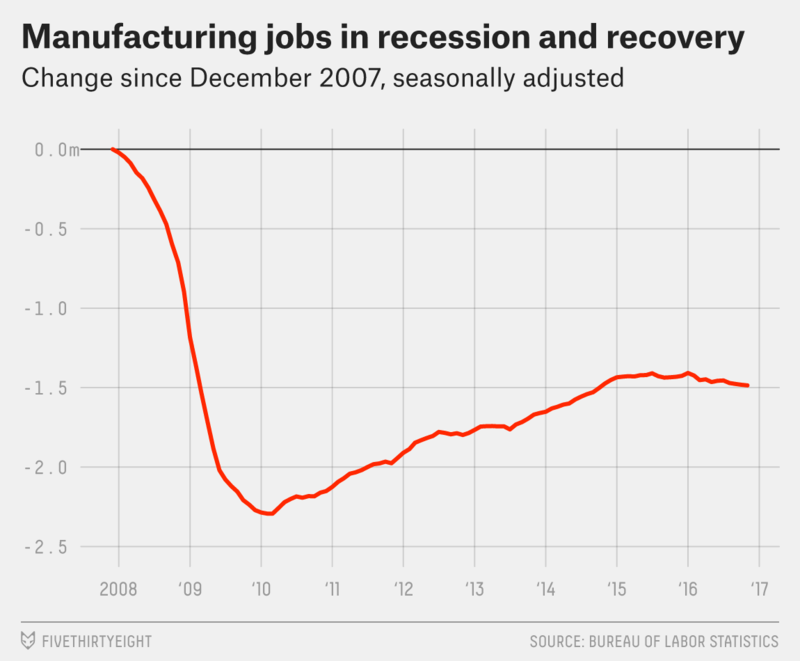 The bigger picture is that manufacturing’s strong post-recession rebound in employment is over. The sector lost more than 2 million jobs in the recession and regained about one-third of them before employment leveled off in 2015. And over the even longer term, manufacturing has followed a stair-step pattern since 2000, dropping sharply and then leveling off, but never meaningfully increasing. That trend is driven by forces — globalization, automation — that Trump is unlikely to be able to reverse. Will the Fed move? Friday’s report is the last before the Federal Reserve’s policy-making Open Market Committee meets later this month to decide whether to raise interest rates for the first time in a year. The Fed, which once expected to raise rates four times this year, has repeatedly held off amid signs of weakness in the economy. But at its last meeting in November, the Fed strongly hinted that it was done waiting, and Friday’s report is unlikely to change that. Most economists thought the report would have to be actively bad to persuade the Fed to hold off; Friday’s report, for all its mixed signals, was solid enough to suggest that the economy remains on firm footing. Fed Chair Janet Yellen and her colleagues are eager to raise rates in order to prevent inflation from taking off, and they believe the economy is strong enough to absorb a rate hike without the job market losing its momentum. When they raised rates a year ago, however, markets concluded the Fed might have made a mistake; Yellen will be watching closely to see if that happens again. CORRECTION (Dec. 2, 12:33 p.m.): A previous version of this article misstated the increase in manufacturing jobs during the economic recovery. The sector has regained about one-third of the jobs lost during the 2008-09 recession, not two-thirds.